I was born in 1961 in Mainz, near Frankfurt/Germany. In July 1969 I watched TV as long as my parents let me - I remember it was a breathtaking experience for me. Still I have the newspaper clips from that time. Later Apollo missions were not covered so well on TV, although I recently learned that it was still better on German TV than on US commercial stations. So the first chance to see the Apollo 15, 16 and 17 EVAs in full length was the ALSJ. 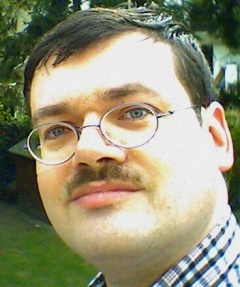 I later studied Physics, and are now working as an engineer for a semiconductor company in Mainz. My interest in astronomy (although I am not an observer) and spaceflight has maintained - although I now rather admire the unmanned missions, unless someone goes back to the Moon or beyond.